Be ahead of the game! Sign up for our newsletter and get notified of new content! ---TOP SITES--- Win £1000!!! Gameswire AdTrader MatchON Workthing The Mutual Compare Prices! By reading the third line you will be aware that this game has not been released in the West. So in all honesty why review it? And more importantly why should you read it? Many of you may be surprised that this was a top priority purchase for me, more of you may be surprised to learn that you have actually played a previous version of this game. Depending whether you are Sega or dare I say it? Yes! Nintendo led, you would have been able to play "Dr. Robotniks Mean Bean Machine" or "Kirby's Avalanche". Both of these games were Puyo Puyo, but as is the norm all the typical Japanese characters were replaced with Western friendly ones. Puyo Puyo 4, is obviously the fourth in the series and to be honest little has changed. 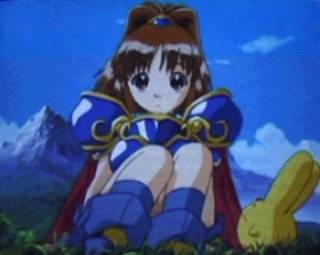 This time around you take control of a little girl in a short skirt and armour, the Puyo Puyo circus has come to town. The circus is an exciting place for a young girl, and she quickly becomes curious and enters the circus to see all the friendly people in their circus costumes. The circus performers don't take kindly to you wandering around and they take out their aggression via bouts of Puyo Puyo. This is where the story begins, but as it is all in Japanese it is hard to follow. Basically as you progress through the various circus acts the hidden truth of the Puyo Puyo circus comes to a thrilling conclusion with your alter ego! These story sections are played out in bouts of Puyo Puyo with the story text preceding each round. A new feature for Puyo Puyo 4 is the special attack. Special attacks are earned by pulling off successful combos, you can have a maximum of 3 special attacks stocked in each round. Special attacks vary depending on the character, some make all the Puyo Puyo the same colour so the disappear, whilst others remove whole columns of Puyo Puyo. In each area of the circus you will encounter small groups of performers, the last of which is a boss. By defeating the boss they decide to help you and you can select which helper you desire before each round. It is important to know your helpers as in the single player game they act as your special attacks. Puyo Puyo is a good one player game, but it is most fun in multi player mode, playing against human opponents is always best especially if you pick a character with an excellent special attack! The special attack features injects some randomness into the bouts and can cause rounds to last up to 20 minutes! Unlike other puzzle games like Tetris or Columns, Puyo Puyo rewards you when you perform successful combo's. Combo's are achieved by placing one Puyo Puyo, which then causes a chain reaction making more Puyo Puyo collapse and forms groups of 4 or more Puyo Puyo and disappear. 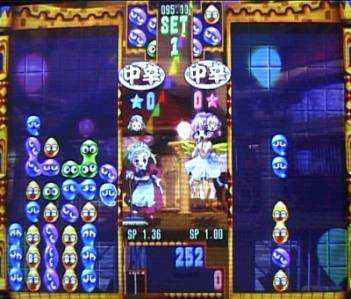 The Image here shows that when the blue/purple Puyo Puyo reaches the bottom the blue Puyo Puyo will disappear causing the yellow Puyo Puyo above them to fall down, and form another group of 4 Puyo Puyo and so on. This simple combination gave the opponent around 60 clear Puyo Puyo! The music and sound effects in Puyo Puyo 4 are oh kay. The music is good but with bouts sometimes lasting up to 20 minutes they should have eliminated the 3 second sound gap so the music appeared continuous. All the Puyo Puyo characters talk and yell when you pull off successful combinations, but as they are speaking Japanese you can not understand a word of it. Sometimes they appear to shout 'Bananas are fat' but don't quote me on that. This game is in Japanese, and unlike many Japanese imports it features no English Text, so the menus will confuse you to start with. Sega have no plans to release this game, this is a shame as the game is definitely up there with the best of the Dreamcast puzzle games. Those of you who can play import games should try and check it out. 7 Top quality anime characters will bring a smile to your face. Graphics suit the game perfectly. Sound 6 Music is your typical bouncy puzzle affair, with some crazy sounding vocals to us Western players. Gameplay 9 Playing against your friends this game will last a lifetime. The single player mission will provide a couple of weeks challenge, whilst the additional single player options will entertain for longer. A game you will keep coming back to time after time, due to its simplicity. Most importantly it is fun. "An excellent game full of Fairies, Washer woman and Mermaids! Combine with some of the best game play mechanics available in a puzzle game."